As many of you are aware, LMPD Detective Deidre Mengedoht was killed when her patrol car was struck by an impaired driver while conducting a traffic stop on I-64, between 4th Street and 6th Street, in downtown Louisville. Detective Mengedoght had served with the Louisville Metro Police Department for seven years and is survived by a young son. On behalf of Raising Cane’s, we ask to work with each of you, as one community, to honor Deidre for her service and provide financial assistance for her family. 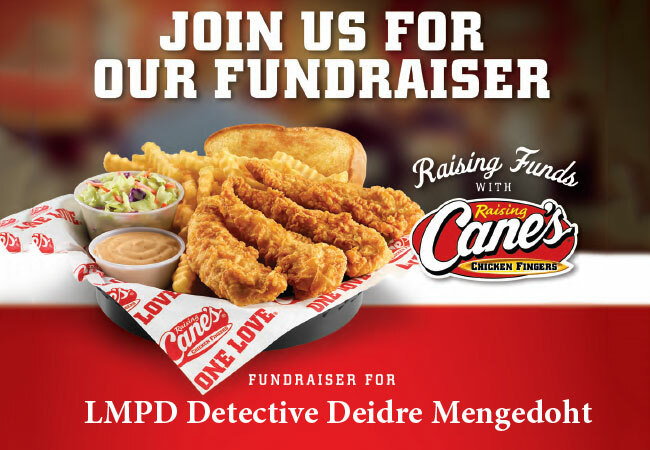 We ask for your support as we host an all-day fundraiser (10am-10pm) on Wednesday, February 6th at the Hurstbourne Parkway Raising Cane’s . We will be donating 20% of sales and accepting additional donations for Deidre. In order for this be successful, we need your help sharing the attached flyers and press release among your workplace and with family and friends. It would greatly be appreciated. To share through social, below is a link to the Facebook event. For those that knew Deidre, she cared deeply for those she swore to protect, and the community she felt called to serve. Those that are included in this email, we hope you all are able to attend. Together we can make a big impact.